Sugary drinks have been blamed for a surge in cases of the painful joint disease gout. Men who consume two or more sugary soft drinks a day have an 85% higher risk of gout compared with those who drink less than one a month, a study suggests. Cases in the US have doubled in recent decades and it seems fructose, a type of sugar, may be to blame, the British Medical Journal study reports. UK experts said those with gout would be advised to cut out sugary drinks. 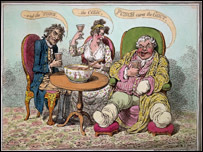 About 1.5% of the UK population currently suffers from gout and there has been an increase in numbers over the last 30 years - although the condition is more associated with Victorian times. The symptoms of painful, swollen joints, mainly in the lower limbs, are caused when uric acid crystallises out of the blood into the joints. US and Canadian researchers said the increase in cases had coincided with a substantial rise in the consumption of soft drinks. Previous research had also shown that fructose increases levels of uric acid in the bloodstream. To look in more detail, the team carried out a 12-year study of 46,000 men aged 40 years and over with no history of gout, asking them regular questionnaires about their diet. Over the period, 755 newly diagnosed cases of gout were reported. The risk of developing the condition was significantly increased with an intake level of five to six servings of sugary soft drink per week. This link was independent of other risk factors for gout such as body mass index, age, high blood pressure and alcohol intake. Diet soft drinks did not increase the risk of gout but fruit juice and fructose rich fruits (apples and oranges) were associated with a higher risk, the researchers said. But this finding needs to be balanced against the benefit of fruit and vegetables in preventing other chronic disorders like heart disease and stroke. Dr Hyon Choi, from the University of British Columbia, in Vancouver said dietary advice for gout had focused on restricting purine-rich foods, such as red meat and beer. He said practitioners should advise patients with gout to reduce their fructose intake. "I can think of some situations, for example in severe treatment failure gout, where reducing sweet fruits, such as oranges and apples could help," he added. Dr Andrew Bamji, president of the British Society for Rheumatology, said anecdotally cases of gout appeared to be rising. "When you think about it, it makes a lot of sense in that fructose inhibits the excretion of uric acid. "I will certainly change my advice to patients and I suspect the number drinking fructose is quite large."